Flannel sheets are widely known to be warmer compared to regular sheets, blankets, or comforters. Using flannel sheets is even better than raising your room’s temperature. Shopping for flannel sheets is usually done to prepare for fall or winter, but these cozy and soft sheets are excellent for year-round sleep too, especially if you often feel cold at night. Read our complete guide about the best percale sheets. Why Should You Choose Flannel Sheets? There are several advantages you can experience if you choose to use flannel sheets. A good flannel sheet is instantly warm. It feels dry, comfortable, and inviting. The instant warmth probably is the most important quality in a flannel sheet. Thanks to this flannel characteristic, you will never experience any chilly spots on your bed so you won’t wake up at night, tossing and turning to look for warmth. You will also have a better sleep quality because of this. Even people who have successfully defeated winter depression recommend you to use flannel sheets to keep your spirits up. Indoor heating is known to make the air dryer. This will make your throat and nasal passages dry, as well, leaving you vulnerable to respiratory issues such as a cold, flu, and even sinus infection. Rather than fiddling with the thermostat, it is better if you use flannel sheets instead. Flannel sheets are healthier for your wallet, too, as you can reduce your heating costs. Winter may be particularly difficult for the elderly, especially those with arthritis and joint pain. Flannel material will help them to stay warm, so high quality flannel sheets may just be a great, thoughtful gift for an older member of your family. Flannel is a material that is made by a process called napping. It is done by passing a thick base fabric over heavy steel cylinders, each with thousands of sharp metal teeth. The hundreds of thousands of short fibers that are pulled from the base fabric will form millions of insulating air pockets and create the fuzz that makes flannel feel warm and cuddly. The best base fabrics for flannels are either made of cotton flannel or micro flannel. Both of these fabrics are warm, but each is blessed with other qualities that may be more suitable for your needs. This material is relatively thick, thicker than micro flannel. Because of this, cotton flannel will hold its shape and gives your skin more breathing space. If you want to avoid having your skin come in contact with a synthetic sheet all night, choose cotton flannel material. This material also feels drier and gives you a fuller, more comfortable feel. As you may already know, cotton can absorb a great amount of water and wicks away moisture. This is why if you are prone to sweating under the sheets, it is wise to choose cotton flannel. As for comfort, because cotton flannel is about 25% heavier than micro flannel, it can give you a more weighted feel that will lead to better sleep. Last but not least, if you want the authentic, luxurious experience of flannel, choose cotton flannel. However, there are cheaper versions of cotton flannel that may feel rough to the skin. Lower quality flannel sheets such as this use a heavy base fabric that uses thick yarns to add on the weight. To combat this issue, choose a higher quality cotton flannel sheets, maintain them properly, and replace them with new ones every few years. A note for consumers who decide to purchase cotton flannel: all cotton flannel sheets are prone to shrinking, about 8-11% from its original size. Don’t worry that you will end up with a ridiculously small flannel sheet, as flannel sheets are cut oversize in order to accommodate this shrinkage. Typically, all shrinkage is gone after three washes and at this time, you can see your flannel sheet’s actual size. There are pre-shrunk versions of cotton flannel, but they will also experience shrinking and their usage is not recommended because they underwent chemical treatments that reduce absorption and softness. Compared to cotton flannel, micro flannel feels softer thanks to its microfiber yarns. This type of yarn contains millions and millions of thin filaments, which contribute to making the sheets feel velvety and smooth. Many people with dry or sensitive skin will love this soft feeling and tend to choose micro flannel over cotton flannel. Natural cotton material just don’t have as many fibers as man-made polyester material. Also, thanks to the synthetic nature of the material, most micro flannel sheets are cheaper than cotton flannel. They also tend to last longer, because polyester synthetic fibers are strong and durable. This also means that micro flannel sheets will retain its softness longer. Another advantages of micro flannels include easy maintenance and less shrinkage. Micro flannel sheds less lint compared to cotton flannel, so you don’t have to do a lot of product care. This material also dries faster and holds less stain, so it is perfect for those of you who have young children in the house. So, if you have a limited budget or if you want something that is easy to maintain, micro flannel is the right material for you. Last but not least, micro flannel doesn’t have any electrostatic activity, unlike cotton flannel, so it doesn’t repel pets. When you climb into cotton flannel sheets, sometimes you can see sparks due to electrostatic activity which may shock your pets. The downside of microfiber material is that it doesn’t hold its shape. The microfilaments are very fine and pliable that the sheets drape easily and stay closer to your skin. Moreover, polyester filaments transfer perspiration so they can feel sticky compared to cotton, which absorbs sweat. So if you like to use lotion or moisturizer, this may not be the suitable material for you as lotion may accumulate on the flannel’s surface, collapsing the insulating air pockets and making your sheets feel more stickier than you’d like. A good tip when selecting micro flannels is to walk away from sheets that are too budget friendly. Typically, they will be extremely thin or see through and may easily tear through normal use. Here are some of the things you need to take note of when selecting the best flannel sheets for your needs! Don’t focus on thread count, focus on weight instead. Flannel is commonly described by weight. A product that is marked ‘1 oz’ means that one square yard of said sheet weighs 1 ounce. Regular cotton sheet generally weighs 3 ounces. For cotton flannel sheets, the best weight is around 5 oz. For micro flannel sheets, the best weight is 4 oz. However, heavier does not always mean better. Flannel sheets that are too heavy are a sign of poor quality. This means the manufacturer uses thick yarns that are difficult to nap. If you can see the individual yarns on a flannel sheet, it means the product is not well napped and not of a good quality. Instead of keeping you warm, it will feel like a burlap. For cotton flannel, choose products either from German or Portugal. A good Portuguese flannel has similar quality with its German counterpart but tends to be less expensive. For micro flannel, Chinese manufacturers produces the best products. Besides cotton and polyester, manufacturers sometimes combine other materials into flannel. Cotton-polyester blend is one example of such hybrid. It is made to provide both warmth and durability, but the reality is this combination often feels rough and creates many fiber clusters that may end up breaking away from the base fabric. Another additional ingredient to flannel is flame retardants. This is a chemical that can be used to treat flannel sheets. Look for products that explicitly mention that they do not use chemicals, as you do not want to subject your family to the risk of chemicals for 8 hours every night. Expertly crafted in Portuguese mills, MALOUF’s Woven flannel achieves the perfect balance between softness, warmth, and durability. The brushed 100% cotton weave has a velvety soft touch that promotes cozy sleep and breathable, year-round comfort. The surface is slightly napped on both sides to retain warmth and give it the smooth hand known to high end flannel. Heavyweight flannel has a durable fiber structure that reduces pilling and excess lint to maintain the lush finish. 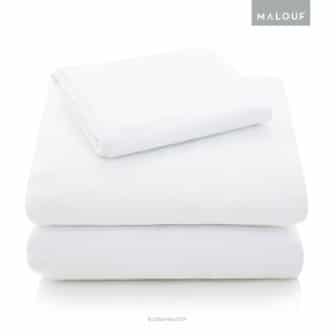 MALOUF’s flannel sheet uses breathable, brushed 100% cotton. They do not combine the cotton with any other material, which practically guarantees your comfort. The cotton they are using comes from Portugal, a country that is known as the world’s best flannel bedding manufacturer. Portuguese flannel is notorious for its luxurious, soft feel and superior durability. The cotton used to make this product is of a high quality and the surface is slightly napped on both sides. Most cotton flannel has double napped surface in order to retain warmth and softness. MALOUF Woven’s cotton flannel is weighted at 190 GSM or 5.6 oz per square yard. It is indicative of a good, thick cotton that will keep you warm at all times. MALOUF Woven Heavyweight Flannel Sheet is available in 5 colors: White, Pacific, Oatmeal, and Coffee. This product is available as a pillowcase, a flat sheet, and a fitted sheet. The fitted sheet features a deep pocket that will accommodate most mattress depths up to 18 inches with a smooth, secure fit. In total, there are 4 sizes offered: Queen, King, California King, and Split King. Crafted in Portuguese mills, MALOUF has created the perfect blend of comfort and durability. Typically, cotton is already a durable material that can withstand wear and tear. However, MALOUF’s heavyweight cotton fiber structure is also pill resistant. This means the fibers will not easily separate from the base fabric, and you can count on the sheets’ durability even after a long time of using. MALOUF is very confident in their creation and therefore, all consumers will receive a 5 year warranty coverage starting from the date of purchase. 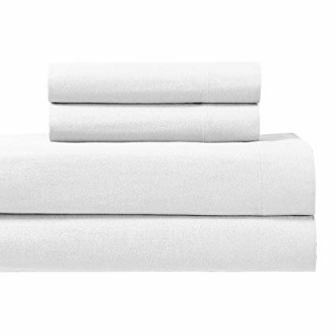 Pinzon is Amazon’s special brand for luxury towels and bedding, including bed sheets, blankets, pillows, and more. This brand has received many praises and high ratings from customers due to its quality and durability. The cotton used to make this product originated from Portugal, one of the best cotton producers in the world. Pinzon claims this product to be heavy weight and in reality, it truly is. The cotton used weighs 190 GSM or 5.6 ounces per square yard. You may already know that cotton fabric fabric is measured not by thread count, but by the number of ounces it takes to make up a square yard. As a reference, a good cotton flannel sheet should weigh at least 5 ounces per square yard. The cotton itself is Portuguese cotton, one of the best in the world in terms of quality yet still on the affordable side. Pinzon Signature Cotton Heavyweight Velvet Flannel provides luxurious softness in a breathable weave thanks to the double napped finish on both sides. The napping also enhances the warmth of the fabric, keeping you warm in the cold weather. This product is made in OEKO-TEX Standard 100 factory, an independent certification system that ensures textiles meet high safety and environmental standards. This flannel sheet is designed with a 4 inch hem on the flat sheet and pillowcase models. Meanwhile, the fitted sheet can fit mattresses up to 17 inch thick. There are 11 colors and motives to choose from, and they are Aubergine, Chamois, Cream, Floral Amethyst, Floral Graphite, Floral Smokey Blue, Italian Roast, Graphite, Smokey Blue, Thyme Green, and White. Pinzon Signature Cotton Heavyweight Velvet Flannel Sheet is available in 3 bed sizes, including Queen, King, and California King. You can purchase this product as a set of pillowcase, a duvet cover, or a sheet set (includes flat sheet, fitted sheet, and two standard size pillowcases). This product is machine washable and dryable. Pinzon used 100% combed cotton for optimal strength, lustrous appearance, and super smooth hand feel. In a combed cotton, the yarn has gone through a long combing process to line the fibers straight and perfectly parallel, making the yarn stronger and more compact. This combing process also removes short, uneven fibers and debris that may weaken the yarn and make it feel rough. This product is backed by a 1 year limited warranty. Royal Hotel invites you to wrap yourself in the soft, luxurious, thick, heavy, and soft cotton flannel sheets like those found in world class hotels. These fine luxury bed linens are crafted from long staple cotton with 170 GSM which makes them extra thick and soft. Comfort, quality and opulence set Royal Hotel’s luxury bedding in a class above the rest. Elegant yet durable, these flannel sheets will get even more soft with each washing. If you have never experienced the luxury and elegance of high quality sheets, try feel the difference with Royal Hotel’s Heavy Soft Cotton Flannel Sheets. Royal Hotel’s Heavy Soft Cotton Flannel Sheets are made of 100% natural cotton. The weight of the cotton is 170 GSM or around 5 ounces per square yard. Although it is not necessarily appropriate to be called heavy weight, this kind of weight is adequate to give you warmth, softness, and quality. Royal Hotel uses cotton that is made in China. The manufacturing process is also done in Chinese factories. Royal Hotel provides 6 color choices for their Heavy Soft Cotton Flannel Sheets. They are White, Sea, Taupe, Ivory, Blue, and Gray. 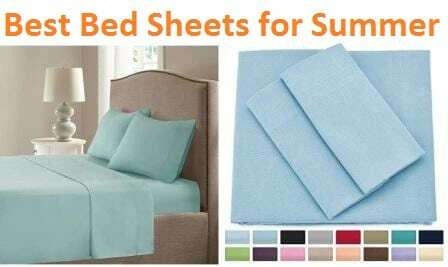 One set of flannel sheets set contains one flat sheet, one fitted sheet, and two pillowcases. The fitted sheet is equipped with elastic all around the edges and will fit mattresses up to 16 inches deep. Royal Hotel’s Heavy Soft Cotton Flannel Sheets is available in many sizes, including Twin XL, Full, Queen, King, and California King. This product is machine washable. However, to enhance the cotton flannel’s durability, please wash in cold water with similar color. When drying with dryer, tumble dry on low. Do not bleach. There is no warranty information regarding this product. This product is a part of Pinzon’s 160 Gram Plaid Velvet Flannel Collection. All of the products in this collection is recognizably soft to the touch. The flannel is a woven, brushed cotton fabric that gets measured not by thread count, but by the number of ounces it takes to make up a square yard. With a flannel weight of 160 grams per square meter, the sheet set offers both durability and supple softness. In addition to being napped on both sides for enhanced velvety softness, Pinzon Plaid Flannel Sheet is perfect for keep you warm during the colder months. As usual, Pinzon only uses 100% imported quality cotton that is made in Portugal. Portuguese cotton is widely known for its high quality and affordability. This flannel sheet is a part of Pinzon’s 160 Gram Plaid Velvet Flannel Collection. This means, at 160 GSM or 4.7 ounces per square yard, the fabric is slightly thinner than other products in this list. This flannel sheet is napped on both sides of the surface to give it an ultra velvety feel. Pinzon manufactures their products in OEKO-TEX Standard 100 factory, an independent certification system that ensures textiles meet high safety and environmental standards. 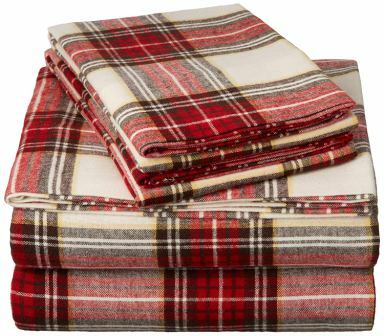 Pinzon produces their Plaid Flannel Sheet in 7 colors, including Blackwatch Plaid, Bordeaux Plaid, Brown Plaid, Cream and Blue Stripe Plaid, Cream and Red Stripe Plaid, Dark Red and Grey Stripe Plaid, and Grey Plaid. One set of sheets contain one flat sheet, one fitted sheet, and two standard size pillowcases. The product is designed with a 4 inches hem on the flat sheet and pillowcases. Meanwhile the fitted sheet can accommodate mattresses up to 16 inches in depth. Pinzon’s 160 Gram Plaid Velvet Flannel Sheet Collection is available in 7 sizes: Twin, Twin XL, Full, Queen, King, California King, and Standard. This product is machine washable and dryable. Pinzon is a product of Amazon and therefore, this product is supported by 1 year limited warranty from Amazon. 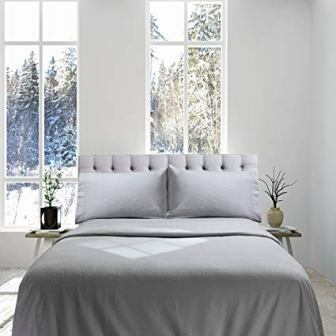 Simple yet contemporary, this Pointehaven sheet set will enhance your bedroom decor for years to come. 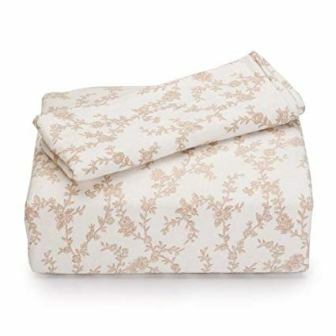 Indulge in this beautifully patterned heavy weight flannel sheet set. There are a number of colors and motives that catches the eye, while the 170 GSM 100% cotton flannel keeps you comfortably warm on cold nights. Oversized for comfort and easy use, this machine washable set is convenient as well as classy. Pointehaven uses 100% cotton flannel of imported quality to make their heavy weight flannel sheet. The actual weight of the cotton is 170 GSM or 5 ounces per square yard. This kind of weight is enough to give you warmth and softness that are expected from flannel sheets. Unfortunately, the country of origin of the cotton used by Pointehaven is unknown. One of the points of attraction from Pointehaven Heavy Weight Flannel Sheet is its various colors and motives. They include Ankara, Autumn Deer, and Winter Dogs model. 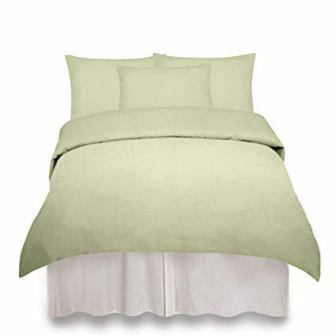 This flannel sheet set is a 4 piece set that includes one flat sheet, one fitted sheet, and two pillowcases. The fitted sheet is fully elasticized and able to accommodate mattresses up to 18 inches in depth. This flannel sheet is designed oversized to accommodate shrinkage and to enhance comfort and ease of use. 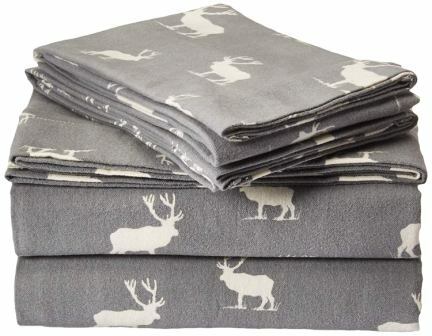 Pointehaven Heavy Weight Flannel Sheet is machine washable. There is no information on product warranty available. This product is a part of Home Fashion Design’s Stratton Extra Soft Printed Cotton Flannel Sheet Collection. These luxury cotton flannel sheets are warm, soft, cozy and comfortable. They are so versatile as you can use them anywhere: bedrooms, guest rooms, vacation homes, dorm rooms, RVs, and even for camping. Home Fashion Designs manufactured this product to keep you warm on the coldest nights and so you can get a good night’s sleep. The patterns printed on the flannels are fun and perfect for both kids and teenagers. 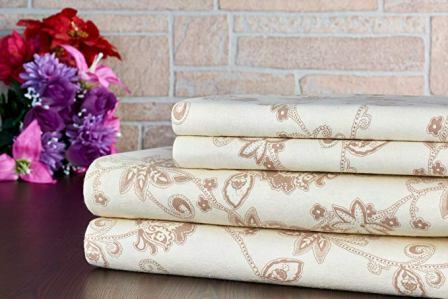 Home Fashion Designs Stratton Collection Extra Soft Flannel Sheet is made from 100% Turkish Cotton. Turkish cotton brings you top quality cotton with affordable price. It is mutli-purpose, versatile, and extremely high quality at an unbeatable value. Another positive point from this type of cotton is its super soft texture. It feels cozy lightweight on your body, and it will give you insulating warmth instantly. It is also breathable and gentle to the skin. The flannel sheets are designed with printed motives. There are 10 motives to choose from, dominated by the color grey. Those motives include Forest Animals, Grey Polar Bears, Hooting Owls, Moose, Penguins, Polar Bears, Snowflakes, Snowy Forest, Snowy Reindeers, and Winter Wonderland. 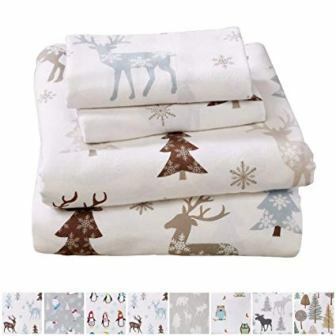 Home Fashion Designs Stratton Collection Extra Soft Flannel Sheet can fit 6 bed sizes, which are Twin, Twin XL, Full, Queen, King, and California King. 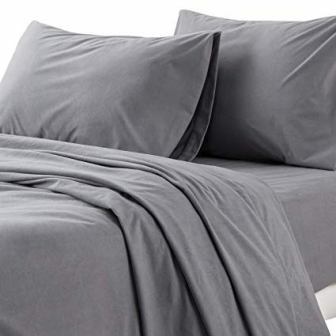 These sheets feature fitted sheets with deep pocket and fully elasticized edges. It can accommodate mattresses up to 17 inches in depth. One set of flannel sheets will include one fitted sheet, one flat sheet, and two pillowcases (or one pillowcase if you purchase the Twin size set). Because this product is made from 100% cotton flannel, the sheets are durable and able to sustain multiple washes throughout the years. Home Fashion Designs’ flannel sheets are easy to wash as they are machine washable. They are also wrinkle resistant, fade resistant, and pill resistant. Manufacturers provide consumer with 100% satisfaction guarantee. Established in 1979, Bedsure has offered premium bedding solutions to bring more sophistication and warmth for millions of people all over the world. With their signature simplicity and inspired details, they are set to not only deliver the softest, coziest, and most comfortable bedding on the market, but also to help you build your dream home. Bedsure’s Flannel Sheet Sets provide the desired comfort and warmth that you are looking for during the winter time. These flannel sheets trap air and body heat to ensure consistent warmth during your nightly sleep so you won’t have to search for a warm spot when you wake up. Indoor heating has been known to dry up the air and leave you vulnerable to cold and flu, so these flannel sheet set will act as a healthier protector to keep you warm. They will also help you to save heating costs during winter. Bedsure’s Flannel Bed Sheet is made of micro flannel, a polyester material. Unlike cotton flannel, micro flannel is more resistant to pilling. The weight of the material is 160 GSM or 4.7 ounces per square yard. It may seem as though it is not enough but unlike cotton flannel, a good micro flannel weighs around 4 oz. This flannel sheets present superb velvety smooth surface with hypoallergenic property to soothe the skin for those of you with sensitive skin conditions. The micro fiber is brushed and napped to give this product its superior softness and to resist pilling even after repeated washings. This product is able to wick away moisture in order to retain balanced temperature for ultimate comfort without trapping in excessive heat. This product is available in two colors, Grey and Light Grey. It can fit 4 bed sizes, including Twin, Full, Queen, and King. The fitted sheets feature deep pocket that will grip any mattress up to 16 inches deep effortlessly. It is also fully elasticized so that you can easily pull it at the border of the mattress to ensure a snug fit. Bedsure’s Flannel Bed Sheet is made of high density yarn that gives the sheets its durable properties. These sheets are machine washable. Mellanni is a different kind of company that prides itself in providing the absolute best customer service in the industry. This product is one to consider when you are looking for the best flannel sheets in the market. Many consumers have given positive reviews and rating to Mellani’s Cotton Flannel Sheets. This flannel sheets are made of the highest quality cotton flannel. It is 100% cotton without any additional materials. This product is made with the best workmanship. It is double napped on both sides which gives the sheets an ultra velvety feel. This cotton flannel sheet weighs 170 GSM or 5 ounces per square yard, a good weight for cotton flannels. With this cotton flannel sheets, you will sleep better and wake up each morning feeling refreshed and full of energy. Mellani’s Cotton Flannel Sheets are the most comfortable and luxurious bed sheets you can find. These sheets are also a great gift idea for both men and women, moms and dads, for Valentine’s Day, Mother’s Day, Father’s Day, and Christmas. Mellani Cotton Flannel Sheets is available in a variety of color and motives, including White, Sage, Blue, Burgundy, Grey, Beige, Blue and Gray Snowflakes, and Plaid Blue. They can fit 5 bed sizes such as Twin, Twin XL, Full, Queen, and King. The fitted sheet is equipped with elastic all around and can accommodate mattresses up to 16 inches deep with its deep pocket. This product is easy to care for as it is fade, stain, shed, and wrinkle resistant. It is pre-shrunk so it will not shrink after washing. The material will get softer after every wash. It is better to machine wash cold and tumble dry low. Mellani provides you with a lifetime guarantee with every purchase. Laura Ashley is a British brand started in 1953. It was started by 28-year-old Laura Ashley and her husband, Bernard. This brand develops scarves, tea towels, and bedding with quirky and humorous images from Victorian playbills and advertisements. Sixty five years after, Laura Ashley is still the leading brand for British design sheets. Laura Ashley’s Flannel Sheet is made of 100% cotton flannel. The cotton is brushed for extra softness. The Laura Ashley brand only uses the 8 leveled brushing standard as the approved process for finishing their quality flannel sheets. In this process, the cotton yarns are woven, then brushed 3 times on the face and once on the back. After that, the fabric is colored and or printed and finished with 3 additional brush treatments on the face and one on the back. This process ensures a comfortable, very soft and cozy finish. The final thickness for this flannel sheet is 160 GSM or 4.7 ounces per square yard. These flannel sheets are available in the following bed sizes: Twin, Full, Queen, and King. There are 10 motives to choose from: Pink, Bristol Paisley, Crestwood Grey, Le Fleur, Mulholland Plaid Blue, Mulholland Plaid Grey, Rosalie, Spring Bloom, Victoria, and Audrey Pink. 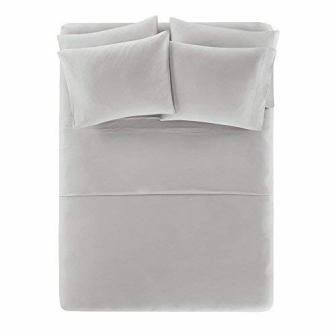 A sheet set includes one flat sheet, one fitted sheet, and two pillowcases (one pillowcase if you purchase the Twin set). The fitted sheet will fit 15 inch deep mattress. This product is pre-shrunk, so you wouldn’t have to worry about shrinkage after washing. It is machine washable with warm water. It is best to wash along with other fabrics of similar colors. Do not bleach. Tumble dry low, and low iron only when needed. It is suggested not to dry clean the sheets. Eddie Bauer offers premium quality home accessories that complements today’s modern active lifestyle. Whether it is classic plaids or casual novelty prints, Eddie Bauer offers a full assortment of bedding and accessories to complement your home. Eddie Bauer’s flannel sheet sets feature great fall colors and prints for your bedroom. The flannel material is pre-shrunk and brushed for added softness. 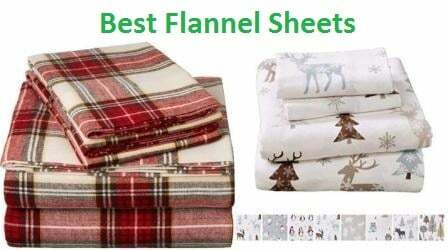 With these beautiful flannel sheet sets, you can stay warm and in style during fall and winter. You can also coordinate your style with Eddie Bauer’s quilts, comforters, blankets, and throws to complete the look. 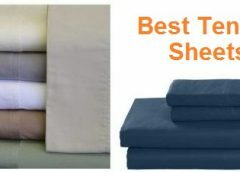 You will love the high quality of these sheets as they are super soft and cozy. The prints are all iconic Eddie Bauer designs. 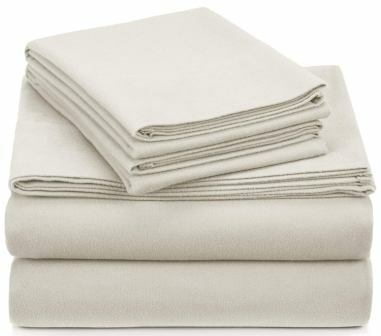 Eddie Bauer Flannel Sheets are made of 100% Portuguese cotton flannel. Portuguese cotton are are rich and renowned for its exceptional quality. These flannel sheets is one of the thickest in the market, standing at 180 GSM or 5.4 oz per square yard. The cotton is also brushed on both sides for softness and warmth that soothes and relaxes you when sleeping. It is developed using an 8 stage brushing process, which enhances the softness of the sheets and eliminates pilling. With each wash, the sheets become even softer and cozier. 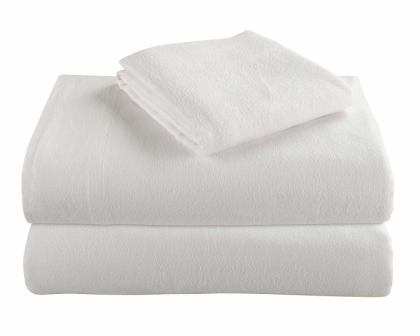 Eddie Bauer’s Flannel Sheets will also wick moisture away from the body as they are very absorbent. These flannel sheets are also perfect for layering. If you get too warm, simply use the flat sheet or the fitted sheet in order to maintain the perfect balance for your best sleep. These flannel sheets will fit Twin, Full, Queen, and King bed sizes. It features a unique design of signature Eddie Bauer designs, featuring iconic plaids and novelty prints. They are perfectly suitable to be paired with other Eddie Bauer bedding collections. These plaids and heathers motives are yarn-dyed for clear, long lasting color. The fitted sheet is designed with elastic around the entire sheet. This ensures a snug fit and keeps it from slipping off of the mattress. The sheets are machine washable. Tumble dry low heat, no iron, and no bleach. Bonne Nuit believes in creating value by producing the best quality products and make them available to you. Bonne Nuit manufactures one of the most comfortable beddings in the market which will make you forget everything and spend a quality me-time on a luxurious and cozy bed sheet. This brand brings to you the best collection of 4 piece bed sheet set including flat sheet, fitted sheet, and 2 pillow covers made of the highest quality cotton fabric to give you utmost comfort and style. Bonne Nuit’s Printed Flannel Bedding Sheets is made of 100% cotton flannel sheet weighing 170 GSM or 5 ounces per square yard. The yarns are extracted from long staple cotton fiber stitched together in a strong and durable weave. It is ultra soft, velvety, and luxurious, as well as warm and comfortable. This product is napped and sanforised finish is applied to help minimize shrinkage. This cotton flannel sheets are certified standard 100 by OEKO-TEX. Oeko-Tex is an independent certification system that ensures textiles meet safety and environmental standards. These sheets are certified free of harmful chemicals to keep your family safe. Product is available in Queen and King size. It is offered in various prints dominated by light colors, among which are Ailin, Ailin Stripe, Bodhi Stripe, Coral Stripe, Cream, Cross Grey, Cross White, Heardly Stripe, Killian Grey Dot, Otto Dots, Pineapple, Santo, Tropicana, White, White Wave, Saffi Dot, and Uma. One set of sheets include one fully elasticized fitted sheet, one flat sheet, and two standard pillowcases. The fitted sheet has deep pockets to ensure a perfect fit. This product is made using combed cotton for optimal strength. Combed yarn is known for its longer yarn and sought after for its optimal strength, lustrous appearance, and ultra-smooth hand feel. The cotton fabric is then tested to meet performance standard such as pilling, shrinkage, color fastness, and tear strength. Machine wash in cold water, gentle cycle, and do not bleach. Flannel weaves are naturally delicate and harsh treatments may result in lint formation resulting in reduced durability. Wrap yourself in comfort with these attractive and warm printed flannel sheets by Bibb Home. Made of 100% cotton flannel, these brushed sheets are incredibly comfortable and soft, and the set is machine washable for easy cleaning. The set includes one flat sheet, one fitted sheet and two pillowcases. Multiple design and color options ensure you get the perfect sheets to match your bedroom decor. This product is made of 100% imported cotton material weighing 160 GSM or 4.7 ounces It is made of the highest quality material and the best workmanship so it will last for a long time. It has a double napped finish on both sides for an ultra velvety, warm, soft, and cozy feel. The cotton is also brushed for durability. This product can fit Twin, Full, Queen, and King bed sizes. It is available in various colors and patterns, including Christmas Leaves, Blue Plaid, Blue Snowman, Colorful Snowflakes, Elegant Paisley, Grey Snowflakes, and Ivory Floral. One set includes one flat sheet, one fitted sheet, and two pillowcases (one in the Twin set). 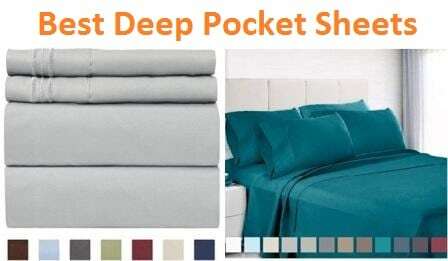 The fitted sheet pocket depth fits up to 16 inch mattress depth. It is also fully elasticized for ease of use. 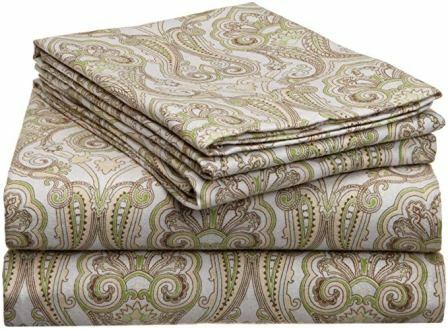 Bibb Home Cotton Printed Flannel Sheet is easy to care for as it is fade, stain, shed, and wrinkle resistant. This product is pre-shrunk so it will not shrink after washing. It also will get softer with every wash. Machine wash cold, tumble dry low. Bibb Home provides 100% satisfaction guarantee for every purchase. Comfort Spaces is a brand that produces pure cotton flannel sheets. Their products are one of the highest selling flannel sheets on the market. Many consumers are said to have positive experiences when using their products. If you are looking for the best flannel sheets in the market, try Comfort Spaces’ Cotton Flannel Printed Sheet Bedding Set. This product is made of 100% cotton flannel that is super soft, breathable, and offers warmer property to make you feel extra cozy at night. Comfort Spaces’ Flannel Sheet is certified as it is manufactured in an OEKO-TEX Standard 100 certified factory, which ensures that the product meets the highest safety and environmental standards and free of toxic and harmful material and safe for human use. Comfort Spaces’ Flannel Sheet is available in the following sizes: Twin, Full, Queen, King, and California King. It is also offered in various colors and patterns, including Aqua, Bulldog, Camel, Geometric Aqua, Geometric Blue, Geometric Grey, Geometric Pink, Plaid Aqua Grey, Plaid Blue, Plaid Red Grey, and Snowflake Blue. One sheet set includes one flat sheet, one fitted sheet, and four pillow cases. This cotton flannel is machine washable on cold, gentle or delicate cycle. Simply tumble dry on low heat and avoid direct heat. 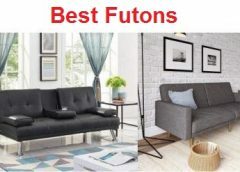 Comfort Spaces offers 100% satisfaction guarantee with every purchase. For over two decades in the home textile industry, Genteele has become one of the global leaders and innovators in high-quality textile solutions by administering great talent and creativity into every weave and detail. Genteele’s flannel sheets are of superior quality and made out of the best and finest fabrics. It is definitely a product you should try when you are shopping for the best flannel sheets. This product is made of the highest and finest quality fabrics available in the textile industry. It is 100% cotton weighing 190 GSM or 5.6 oz. The sheets are ultra-soft and feels like velvet. The cotton flannel sheets are available for Twin, Twin XL, Full, Queen, and King bed sizes. The colors offered include White, Grey, Sage, Ivory, Navy, and Camel. The fitted sheet has a deep pocket that can accommodate up to 16 inches mattress depth. It is also elasticized all the way around with a super strong elastic which won’t give way no matter how many times you take your sheets off and on. Genteele Cotton Flannel Sheet is machine washable in cold temperature water, separately or with similar colors. Do not bleach and line dry if possible. Remove promptly from dryer to avoid wrinkles. Lint or pills are natural by-product of flannel and will subside after a few washes. To help prevent lint or pills, you can add one-half cup of white vinegar to washer. Morgan Home’s Cotton Flannel Sheet is the perfect flannel product to help you style your home and bedroom. It will warm you inside and out all year round. This product is made of 100% Turkish cotton. Turkish cotton is amazingly comfortable, super breathable, and ultra-soft. They are the perfect choice for year round comfort. 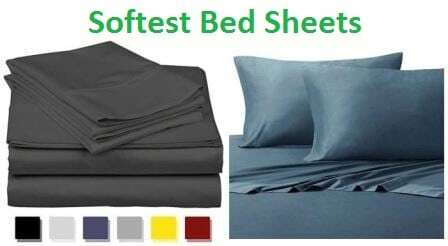 These sheets are made of high quality GSM and are warm and cozy for the winter months but are also light weight and breathable for the summer. They are great kids or adults and for men, women, boys and girls. Morgan Home’s Flannel Sheets can fit Twin, Full, Queen, and King bed sizes. It is available in various attractive colors and patterns, including White, Sage, Blue, Taupe, Grey, Beige, Dover Plaid Red, Ethan Gray, Peaceful Forest, Reo Plaid, and Snowflake Haze Blue. The complete set is comprised of one flat sheet, one fitted sheet, and two pillowcases (or one pillowcase for the Twin size set). The fitted sheet has deep pockets that will fit beds up to 16 inches thick. It is recommended to wash the product before first use, and machine wash cold separately. Morgan Home gives a 100% satisfaction guarantee for every purchase.